I just tossed the last of our garlic into a pot of soup. From now until July I'll be buying the Chilean or Californian stuff at the grocery store like the rest of you suckers. Anticipation of this fact had me planting an extra bed of garlic this fall. And why not? It's the perfect crop, in some ways: plant it in the fall, mulch it, do nothing else until it's time to pull it up midsummer, at which point you have an empty bed for planting your fall cabbage or what have you. Plus, it's the second most popular item at the stand behind honey. 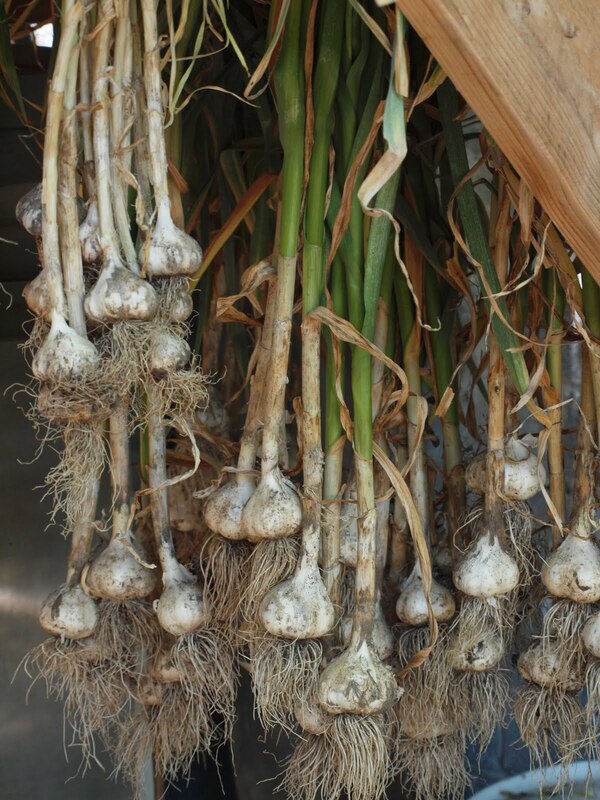 Unlike the honey, it is not much of a moneymaker (I charge 50 cents a head for the larger heads or 3 for a dollar if they're smaller), but people are really impressed with fresh garlic. It's like magic to them ("You grew this? "), and I think it gets them excited about cooking the various other vegetables on display. So I think it's a win. If nothing else, hundreds of garlic plants hanging from the rafters of the patio roof makes me feel like I have a totally legitimate operation going. Sometimes I'll just take a walk back and admire them hanging there. And then there's the potential for my personal supply to last until the next harvest, and that is an exciting prospect indeed.